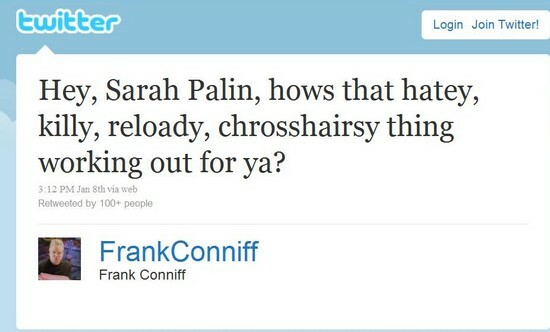 Actually, Palin has a long history of using violent rhetoric and then denying it. Palin said of Julian Assange, “Why was he not pursued with the same urgency we pursue al Qaeda and Taliban leaders?” The US uses drone strikes against the latter. When Assange complained that she was calling for his assassination, she claimed he had misquoted her. Back in 2008, Palin repeatedly accused then candidate Barack Obama of “palling around with terrorists who would target their own country.” Obama had in fact denounced the terrorist past of the person Palin was using to smear him. Palin whipped up her frenzied campaign crowds to shout “terrorist” at Obama, but then denied that she had heard them doing so. It is not just Palin but also the candidates she endorses. Jane Hamsher points out that Giffords’s opponent in the last election, supported by Palin, “Held June Event to “Shoot a Fully Automatic M16″ to “Get on Target” and “Remove Gabrielle Giffords”. That site, like Palin’s own PAC site and lots of other right wing web pages around the internet is now being scrubbed of such material.